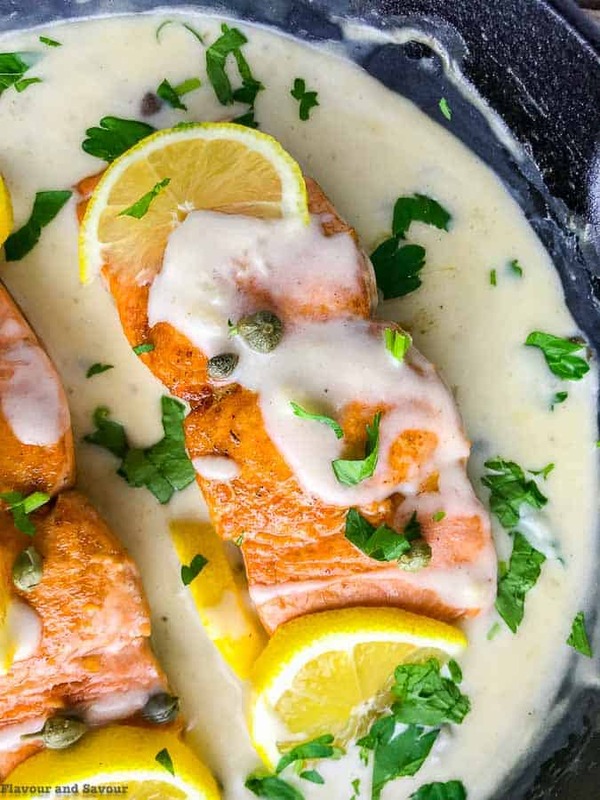 This Creamy Lemon Salmon Piccata is made with pan-seared salmon cooked in a creamy white wine lemon caper sauce. It’s an easy 30-minute dish. 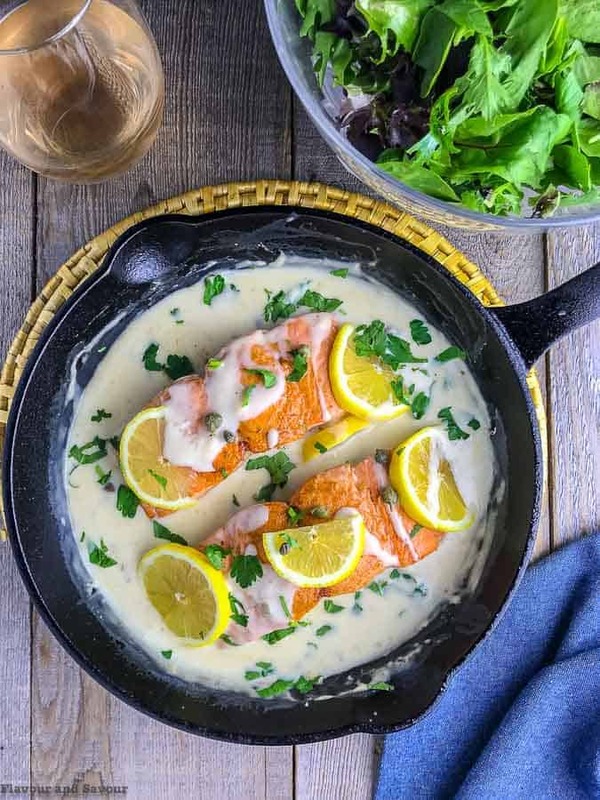 This Creamy Lemon Salmon Piccata has so much flavour! Tender flaky salmon bathed in a warm lemon sauce makes a quick nutritious meal when paired with gluten-free pasta, veggies or a wholesome salad like this Triple Berry Mixed Green Salad. You’ve probably heard the advice of nutritionists and medical professionals to eat more salmon regularly. We’re told to make sure we’re getting enough Omega-3 fatty acids in our diet. While several foods like chia seeds, hemp seeds, Brussels sprouts and walnuts are good sources of Omega-3’s, eating wild salmon is one of the best ways to make sure we get what we need. And it’s so good! 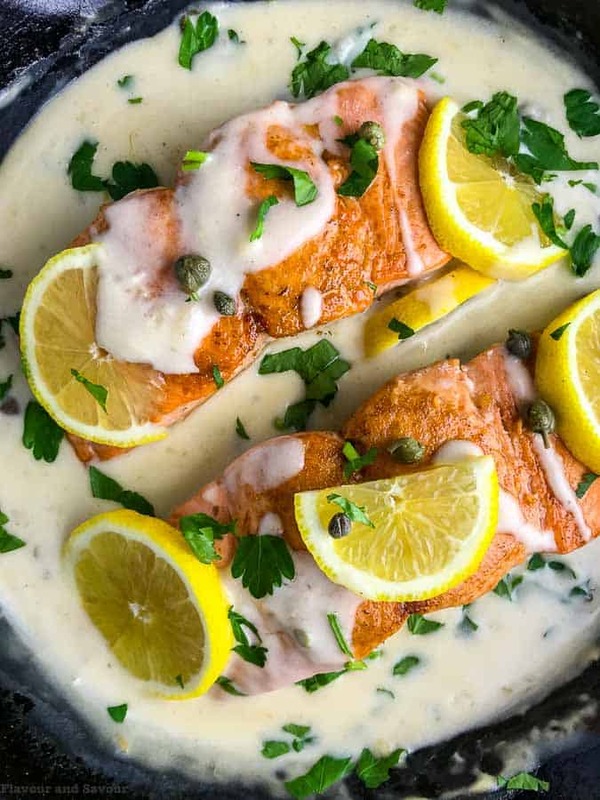 This Lemon Salmon Piccata recipe results in tender fish fillets in a tangy lemon sauce with salty capers, lemon slices and fresh parsley. What could be better than a tasty meal that’s also healthy for us? Omega-3’s may have a host of health benefits for our brains, our hearts, our eyes, and our bones and more. They can help prevent certain types of cancer, help reduce the pain of arthritis, alleviate menstrual pain, protect our skin from sun damage, help us sleep, reduce the risk of Alzheimer’s disease, and help fight autoimmune disease. All that from delicious wild fish! Denis was lucky enough to come home from his last fishing trip with some Chinook salmon. We portioned them into meals, vacuum-sealed them and stocked our freezer. Today, however, I decided to make a lemon sauce for salmon instead. To get perfectly pan-seared wild salmon fillets with a slightly crispy exterior, preheat your skillet. Add a small amount of oil and butter and tip the skillet to make sure the surface is completely covered. Pat the salmon fillets dry, then place skin side down. Space the fillets apart and leave them alone until they’re ready to flip. Cook on both sides for 4 -5 minutes, depending on the thickness of the fillets, then remove to a plate and cover with foil to keep warm. Next, add finely chopped shallot to the skillet and sauté until softened. Add white wine, bring to a boil and scrape up any bits, stirring occasionally until liquid is reduced by half. Stir in 3/4 of the broth, reserving the rest to thicken the sauce later. Then, add the lemon juice and stir. Combine cornstarch with part of the remaining broth and add it to the skillet. Allow it to thicken. If it’s not thick enough to your liking, combine another teaspoon of cornstarch with the remaining broth. Stir in the cream, then remove from heat, add the capers and the cooked salmon, spooning some of the sauce over the fillets. Finally, garnish with chopped parsley or dill and lemon slices. Maybe this is the week to make a commitment to getting those essential Omega-3’s in your diet! 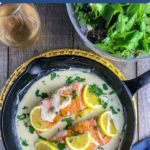 This Creamy Lemon Salmon Piccata is made with pan-seared salmon cooked in a creamy white wine lemon caper sauce. It's an easy 30-minute dish. Pat salmon pieces dry and season with salt and pepper. Dredge in flour, shaking off excess. Heat a skillet over medium-high heat. Add butter and oil. When hot, add salmon pieces, skin side down. Sear for 4 to 5 minutes, then flip and continue cooking for 4-5 minutes or until salmon is no longer raw inside. Cooking time will depend on the thickness of the fillets. Watch carefully to avoid overcooking. Remove from skillet to a plate and cover with foil. Add shallot to the skillet and cook briefly until softened. Add wine, bring to a boil and scrape up any bits from the bottom of the pan until liquid is reduced by at least half. Add 3/4 cup of the broth and the lemon juice and stir. Combine cornstarch with 2 tablespoons of the reserved broth in a small cup. Add to the pan and stir until thickened. If not thick enough, add an additional teaspoon of cornstarch with remaining broth and stir. Add the cream reduce heat to simmer. Remove from heat, add capers and the cooked salmon. Garnish with chopped parsley or dill and lemon slices and serve. This recipe was adapted from my favourite Chicken Piccata recipe in America’s Test Kitchen Cookbook, page 360. This tender moist Mini Gluten-Free Pumpkin Loaf is allergen-free! Made with oat flour, almond flour and applesauce, it’s dairy-free, no refined sugar. The colours are incredible! I love that this can be ready in thirty minutes. Perfect for busy nights! That’s one of the reasons I love fish for dinner, Sharon–quick and easy! A timeless classic – absolutely love this combination of flavours. Thanks Yvonne, Salmon and lemon are always great together! Yum! What a great and easy way to get those omega’s, this is so delicious, thank you! 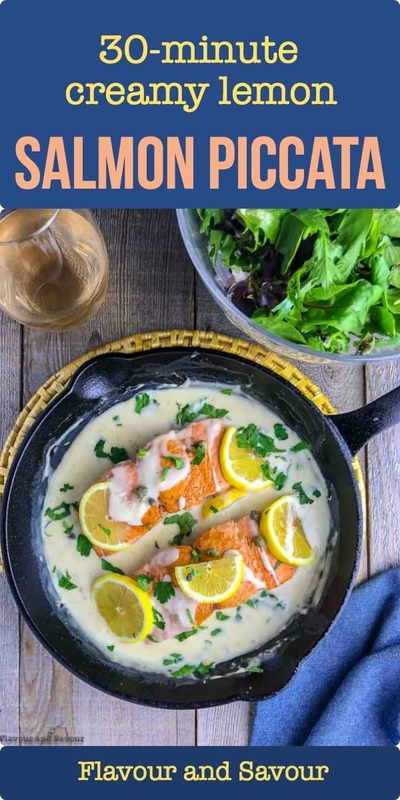 We love wild caught salmon, too, Because I cook it often, I’m sometimes at a loss for recipes, so this one is such a great find, Elaine. I love the creamy sauce, and especially the capers. Thanks for sharing. How nice to have freshly caught salmon in your freezer! I like to reach for salmon whenever I want a quick dinner. Thank you for another great recipe for the collection. This sounds delicious, Elaine! I can totally imagine the tangy salty sauce with the tender salmon…would be delicious with orzo or rice…YUM! 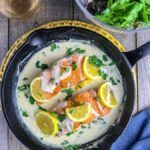 We love salmon in our house, and this creamy recipe looks so flavourful! Pinning for later! Can’t resist a quick weeknight recipe! Thanks Leanne, Yes–salmon (or any fish) always comes to the rescue for a quick meal. If it has been frozen, it thaws quickly, and it takes very little time to cook. Plus . . . we love it! 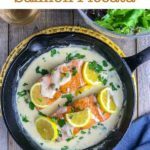 I love a good simple salmon recipe – we eat salmon quite a bit in our house. Thanks for sharing this delicious recipe! Thanks Kristen! It’s such a healthy fish–full of Omega3’s! Happy weekend!